Air Box Is used primarily on Pro-Stock Bikes to settle "negative air" around carburetor. Air Foil A rear wing used to create down force, to increase stability. Break Out Used in handicap racing, refers to a contestant running quicker then dial in time. Burn Down A starting line battle between drivers, where neither driver fully stages to begin the race. The chief starter rarely likes this and could disqualify both cars. The drivers do this in trying to break each other's concentration. Burned Piston When a cylinder runs lean (too much air) and excessive heat builds up causing piston to burn/melt. Burnout The process of spinning the rear tires to generate heat thereby, increasing traction. Christmas tree An electronic device used to start the race, using calibrated-lights to countdown to the green light. Chute Short name for parachute, this devise help slow down race car. Clutch Can Slang name for bellhousing, used to house clutch and flywheel. Clutch Dust A carbon dust created during clutch lockup. Clutch Lockup A progression of the clutch-disc engaging during a run controlled by an air timer system. Dead-On A run that concludes with the ET matching what the driver predicted (dial in) within 1/100 of a second. A prediction matching to 1/1000 of a second is perfect. 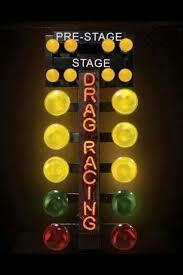 Deep Stage When a driver rolls into staging lights a few inches farther. Delay Box An electronic device used to improve reaction time, allows driver to initiate the run by releasing a button rather than depressing the throttle by foot at the first flash of the starting lights. The unit is actuated by a timer and can be adjusted to 1/1000 of a second. Dial-In The time that a driver predicts that he/she's car will run. This time is posted on the car in a position where the starter can read it. Elimination After qualifying vehicles race two at a time, resulting in one winner from each pair. This continues until one remains. Groove Path of traction laid down by other cars that have gone down the track, e.g. : "in the groove"
Smoke the tires When a car loses traction; also "blew the tires off" or "hazed the tires." Drag Racing; born on the streets of America in the post-World War II era and its roots were planted on the dry lake beds in California's and the Mojave Desert. In 1947, Wally Parks, a military tank test-driver for General Motors who served in World War II, helped organize the Southern California Timing Association and later became its general manager. 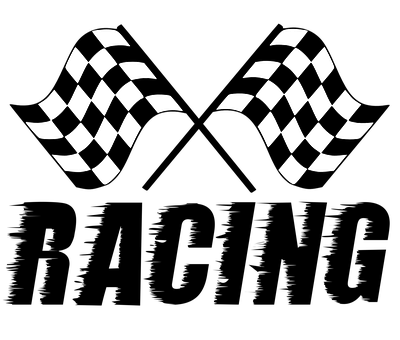 The first SCTA "Speed Week," held at the famed Bonneville Salt Flats in 1949, was the result of a diligent effort of Parks. It was here that racers first began running "against the clock" - actually, a stopwatch. The first drag strip, the Santa Ana Drags, began running on an airfield in Southern California in 1950, and quickly gained popularity among the crowds because of its revolutionary computerized speed clocks. When Parks became editor of the monthly Hot Rod magazine, he had the forum and the power to form the National Hot Rod Association in 1951 to "create order from chaos" by instituting safety rules and performance standards that helped legitimize the sport. He was its first president. NHRA held its first official race in April 1953, on a slice of the Los Angeles County Fairgrounds parking lot in Pomona, Calif. Four decades later, that track has undergone a $6-million expansion and renovation and hosts the NHRA season-opening Winternationals and the season finale, the Automobile Club of Southern California Finals. In 1955, NHRA staged its first national event, called simply "the Nationals" in Great Bend, Kan. Six years later, as the Nationals hop-scotched around the country to showcase the growing sport before settling in Indianapolis in 1961. Now in its fifth decade, NHRA is the world's largest motor sports sanctioning body with 80,000 members, 140 member tracks, more than 35,000 licensed competitors, and more than 5,000 member-track events. "No one could have conceived what has happened," Parks said of the NHRA's tremendous growth and success. "We just had an idea and a strong desire to be self-sustaining ... We wanted to build the organization on its own merit. We saw a need -- that being an avenue for safe drag racing -- and with the help of a lot of good people and a little luck we seem to have had some success." You know; Weight Transfer refers to the front end lifting causing weight to be transferred to the rear wheels....It's not a new wave diet! Mellow Yellow 4 Professional classes. Top Fuel, Funny Car, Pro-Stock, Pro-Stock Motorcycle. 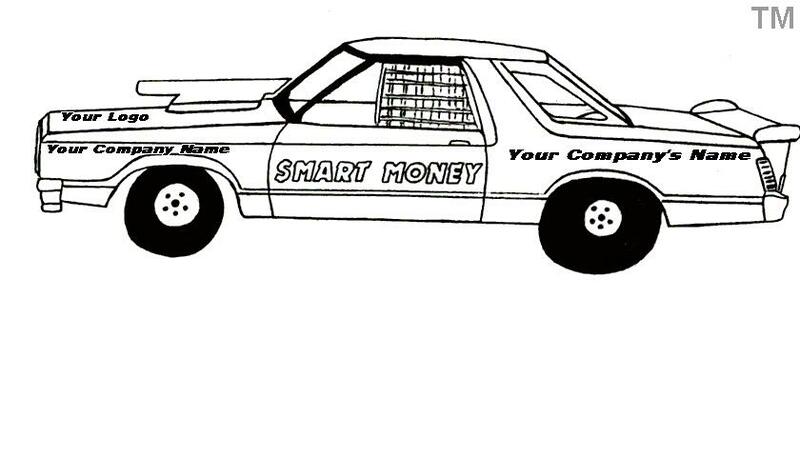 Top Alcohol Draster, Funny Car, Super Comp, Super Gas, Super Street, Comp, Super Stock, and Stock. Other categories include Bracket and Import series. Handi-cap classes enables vehicles with a wide varity of performance to compete against one another. Each driver calculates the ET (elapsed time) his/her vehicle will run. The ET is determined by the driver gathering data during time trails. The dial in time is postwed on each vehicle in order to pir them up in eliminartions. The driver with the slower time is given a head start, this is done by NHRA starter controlling the Tree. JR. Drag Racing Series: This is a series designed to afford youths as young as 8 years old the chance to compete in drag racinh. They are paired up against their peers in replica models of a dragstwer. The distance is 1/8 mile and are permittwed a single cylinder 4 stroke 5 HP engine. The competition is set up a ET Handicap race. This means dialing in time that they believe their car will run. The engine modifications are alomost unlimited; fuel type can be gas or methanol. The uniqueness of drag racing compared to other forms of motorsports is that it allows fans access to the drivers and teams. This makes drag racing a very fan oriented sport and anyone can participate. In order to participate; vehicles must pass safety inspections and drivers must have valid state or competition licenses. Essentially, drag racing is a paring of two vehicles against each other on a straightaway course--a contest of acceleration and reflexes between vehicles and drivers. The accepted measure of distance is 1000' for the Top Fuel and Funny cars and other classes (Pro Stock, Sportsman, Bracket) use a 1/4 mile (1320'), and an 1/8 mile (660') for distance. The racer's primary objective is to become the overall winner of his/her class. To achieve this goal, two car competitions are conducted until there is one vehicle left to the class. In the early days of drag racing a flag man was used to start the race-but, then an electronic device was introduced known as a Christmas tree. This system features a vertical series of lights, displaying a visual countdown for each driver. The drivers try to make their moves between the last amber light and just before the green light come on. The technique in staging and starting is one of the most vital skills a drag racer can develop, since a majority of races are won or lost at the starting line. Unlike NASCAR or other forms of racing where the drivers has several laps to make up any miscalculations, in drag racing you only have a thousand of a second. Upon leaving the starting line a separate timer is triggered for each vehicle and that timer is stopped when the vehicles cross the finish line. This is known as ET or Elapsed Time, the speed (MPH) is calculated by 2 additional lights. The losing vehicle is eliminated and the winner advances to the next round. This continues until, there is only one vehicle left and he/she is declared the winner. 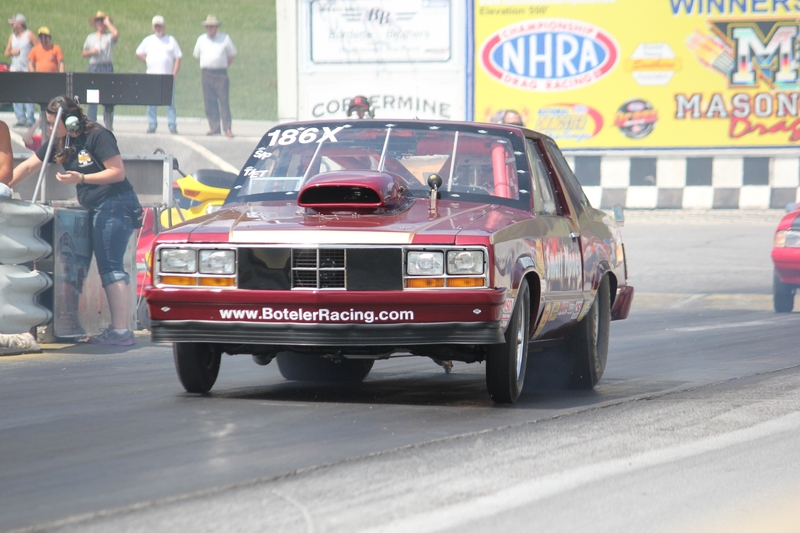 Note: these rules and regulations are widely used in both NHRA and IHRA competition. "The Christmas Tree" debut in 1963 at the U.S. Nationals in Indianapolis Raceway Park.